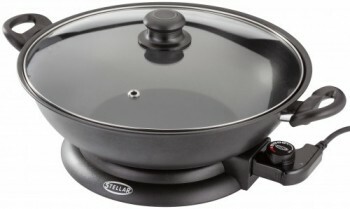 The Stellar Electric Family Wok is the perfect addition to any kitchen. This wok allows you to create delicious, tasty stir fry dishes simply and easily. This wonderful wok is very efficient as there are variable heat temperatures from level 1= 90°C to level 5 190 °C, and the pan responds instantly to the heat that has been selected by heating up and cooling down rapidly. It also achieves the high temperatures associated with traditional Wok Cooking. I found this wok very easy to use and in minutes created a delicious stir fry for my whole family. I used the temperature setting 4 as it gave a high temperature that helped sear the meat and cooked the stir fry beautifully. When shallow frying in this wok, the temperature settings 1 and 2 are the ideal heat as they brown the outside of the meat beautifully. This wok can also be used for braising and stewing. The vented glass lid that is included with the wok can be used when making stews and casseroles. Another fantastic feature of this wok is that it is very easy to clean. It has a PFOA free non-stick cooking surface that makes cleaning very easy. It also has large carrying handles so after cooking you can simply detach the power cord and serve it straight to the table.